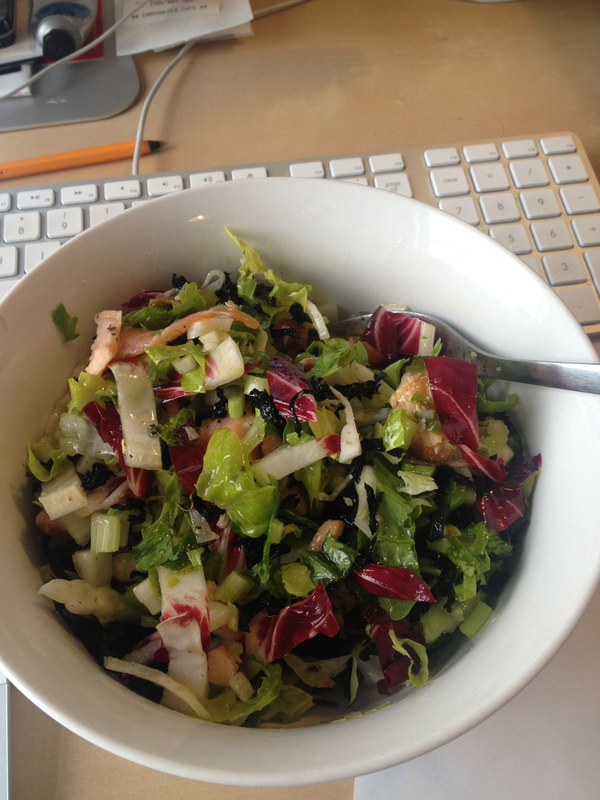 My week has been incredible busy so I am taking my lunchbreak at my desk to share this scrumptious salad with you all. One of my gorgeous house mates, Geraldine, is a master on the barbeque. In the fridge this morning was a piece of salmon that has had the ‘G’ BBQ treatment – it is smoky and al dente – just how I like it. I finely sliced fennel, radicchio, celery leaves and cos lettuce, sliced the succulent salmon and dressed with cracked black pepper, lemon juice and olive oil. Served sprinkled with crunchy wakame flakes – et voila! Super tasty and crunchy and delicious.